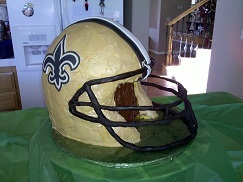 This super bowl helmet cake is a six layer cake with chocolate raspberry icing. There are cardboard supports between every two layers with dowels. I carved the layers after being in the freezer for about an hour. The icing over the cake was tinted to look as close to gold as I could get by adding Yellow, orange and red gel colors. When I started getting close to the gold color I started adding a cocoa powder a little at a time. After frosting the cake I let it set up and sprinkled a little gold luster dust to give it sparkle. I made the face guard out of wire covered with fondant. The stripes are made out of fondant and the logo is on edible paper mounted on white fondant. That is a very cool cake and you did a good job!